Abdullah Abdullah, presidential challenger to Hamid Karzai, announced that he was quitting the runoff election. In a choked-up voice he cited concerns about increased violence in Afghanistan and outrage at the fraudulent election process. 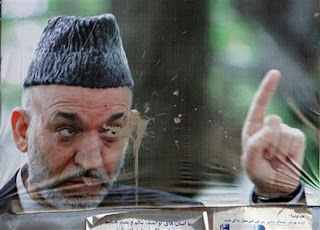 The election was canceled and Karzai was declared president. More U.S. troops died in Afghanistan in October than in any month since that war began eight years ago. A suicide bombing by Taliban militants killed six U.N. staff, and Major General Mike Flynn, director of intelligence for General Stanley McChrystal's headquarters in Kabul, warned that the number of insurgents in Afghanistan (many of whom were from other countries) was now between 19,000 and 27,000, a ten-fold increase since 2004. "I wouldn't say it's out of control right now," Flynn explained, "but this is a California wildfire and we're having to bring in firemen from New York." President Barack Obama caved to pressure from Congress and military contractors and passed a $680,000,000,000 defense bill. Nuristan, a province on the Pakistani border, essentially fell to the Taliban after the U.S. withdrew its forces from four key bases. Similarly in Khost, another eastern province bordering Pakistan where U.S. forces once registered much-publicized gains (and which Richard Holbrooke, now President Obama's special envoy to the region, termed "an American success story"), the Taliban is largely in control. It is, according to Yochi Dreazen and Anand Gopal of the Wall Street Journal, now "one of the most dangerous provinces" in the country. Similarly, the Taliban insurgency, once largely restricted to the Pashtun south, has recently spread fiercely to the west and north. At the same time, neighboring Pakistan is an increasingly destabilized country amid war in its tribal borderlands, a terror campaign spreading throughout the country, escalating American drone attacks, and increasingly testy relations between American officials and the Pakistani government and military. Meanwhile, the U.S. command in Afghanistan is considering a strategy that involves pulling back from the countryside and focusing on protecting more heavily populated areas (which might be called, with the first U.S. Afghan War of the 1980s in mind, the Soviet strategy). The underpopulated parts of the countryside would then undoubtedly be left to Hellfire missile-armed American drone aircraft. In the last week, three U.S. helicopters -- the only practical way to get around a mountainous country with a crude, heavily mined system of roads -- went down under questionable circumstances (another potential sign of an impending Soviet-style disaster). Across the country, Taliban attacks are up; deadly roadside bombs or IEDs are fast on the rise (a 350% jump since 2007); U.S. deaths are at a record high and the numbers of wounded are rising rapidly; European allies are ever less willing to send more troops; and Taliban raids in the capital, Kabul, are on the increase. All this despite a theoretical 12-1 edge U.S., NATO, and Afghan troops have over the Taliban insurgents and their allies. Finally, the New York Times revealed that the President's alleged drug-kingpin brother, Ahmed Wali Karzai, whom American officials regularly and piously denounce, is, in fact, a long-term paid agent of the CIA and its literal landlord in the southern city of Kandahar. If you were a Taliban propagandist, you couldn't make this stuff up. Hey we was just reading your post on my HT C Phone and I was thinking about how well it will work on the new i pad that's coming out. Fleeting thought. Anyway thanks!